/ Butterbur: Benefits, Dosage and Side Effects. 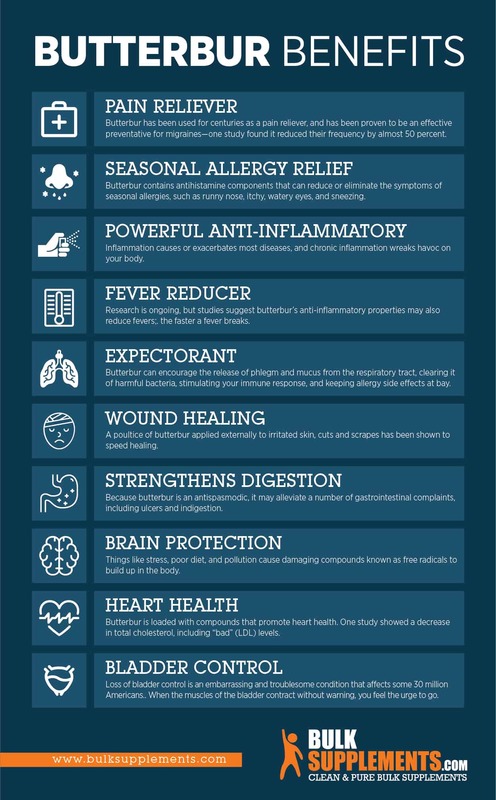 While not as well-known as other herbs, Butterbur has been used for thousands of years to treat just about everything from the common cold to the plague. Today, butterbur is used to treat a variety of health conditions. Clinical studies have proven its effectiveness in the treatment of migraines, seasonal allergies, and asthma. It has significant anti-inflammatory properties, can soothe an upset stomach, and even stimulate appetite. It may help alleviate cough, fever, and other cold symptoms, and when applied externally can speed wound healing. Butterbur is the unsung hero in the world of natural therapies. Also known as Petasites hybridus, butterbur is part of the sunflower family and is related to dandelions, marigolds and artichokes. This unassuming-looking shrub originated in Europe and is now also cultivated in parts of Asia and North America. Butterbur’s unusual name comes from one of its non-medicinal uses: people once wrapped the plant’s large leaves around butter to preserve and protect it during the warm months of the year. Butterbur’s large leaves resemble those of the rhubarb plant–the leaves are so big, in fact, that the ancient Greeks called butterbur ‘hat plant’ because they sometimes wore its leaves as hats to to shield themselves from the sun and rain. Butterbur goes by many other names,, including sweet coltsfoot, bog rhubarb, and capdockin. All parts of the herb — leaf, flower, stem, and root— are used in natural health remedies. Because it is can alleviate so many different conditions, butterbur is a great supplement to keep on hand. Research is ongoing, but studies suggest butterbur’s anti-inflammatory properties may also reduce fevers. The faster a fever breaks, the better your immune system can function and the faster the healing process can proceed. The combination of stress, poor diet, and pollution cause damaging compounds known as free radicals that build up in the body. The accumulation of these factors is harmful to cells, result in oxidation, and can lead to chronic disease. Antioxidants can slow and even reverse this damage. Migraines are a serious disorder, affecting over 1 billion people worldwide, including approximately 13% of the adult population in the United States. (x) While migraines are common, they remain difficult to treat, in part due to the wide variety of causes. Incapacitating, throbbing pain, nausea, vomiting, and sensitivity to light and/or sound are typical symptoms of migraines. While there are many drugs available to treat the symptoms, they do not work for everyone, and the side effects can be as troublesome as the migraine itself. (x) Several clinical trials have shown Butterbur to be a natural and highly effective remedy for both the treatment and prevention of migraines. There are two specific compounds in butterbur believed to combat migraines: Petasin and Isopetasin. The combination of these compounds reduces the symptoms, severity and duration of a migraine. x) . Due to its strong analgesic properties, butterbur is a great choice to prevent and relieve tension headaches and migraines. A German study showed that butterbur used alongside traditional treatments helped to reduce the number, severity and duration of asthma attacks. (x) Participants were also able to reduce the amount of medication they needed to take to relieve asthma. Butterbur can be harvested in the wild; however, some of its properties can be toxic if improperly handled. Butterbur extract is available in a variety of different ways, and can be taken as a capsule, powder, tea or tincture. Always talk to a health professional or herbalist to ensure you’re taking the correct dosage, since long term use is not recommended. For the treatment of migraines, 75 mg, taken two times per day for four months, was shown to reduce frequency. As a tea, brew one teaspoon of butterbur powder or butterbur extract in one cup of water and let simmer for 10-15 minutes. Drink up to three times per day. Improperly prepared butterbur contains compounds called pyrrolizidine alkaloids (or PAs) that can cause liver damage, so it’s important to buy your supplement from a reputable supplier. Only buy butterbur that is certified PA-free. Butterbur is generally well tolerated, however, some individuals may experience mild side effects such as belching, diarrhea, or fatigue. Women who are pregnant, planning to become pregnant, or nursing should not take butterbur. 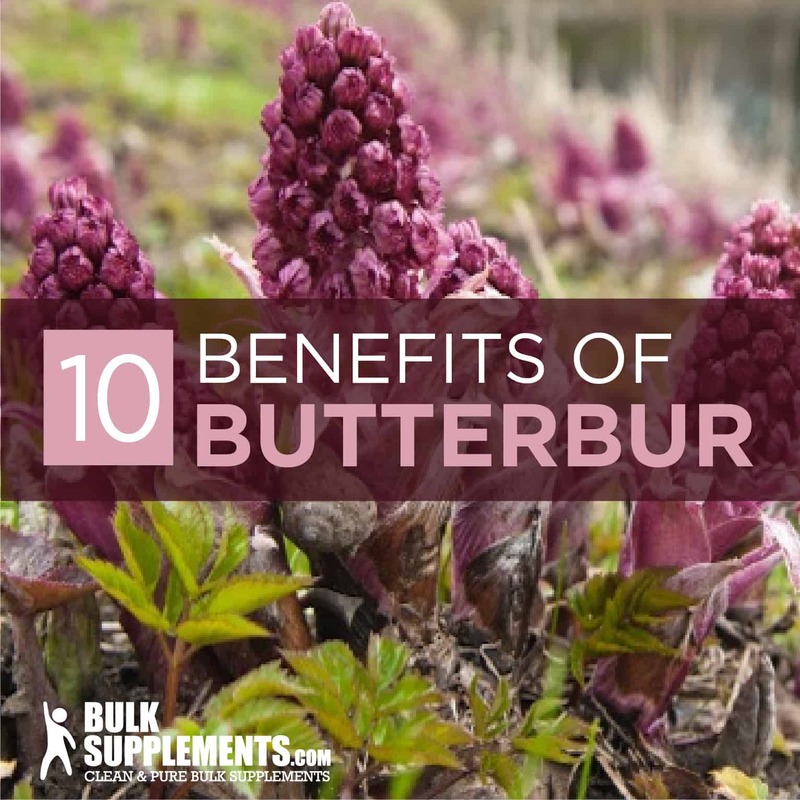 If you are already taking other supplements that contain the same active ingredients as butterbur, such as borage, ragwort or gravel root, do not take butterbur. If you are allergic to ragweed and related plants such as marigolds, daisies, and chrysanthemums, talk to your doctor before trying a butterbur supplement, as it may cause an allergic reaction. Butterbur is not recommended for those with liver or kidney disease. Always consult with your doctor or nutritionist before adding an herbal supplement to your health regimen. Several herbs have a good track record of providing headache relief and they include peppermint, passionflower, ginkgo, cayenne, willow, meadowsweet, valerian, skullcap, chamomile and boswellia. Recent medical trials have proven it to be an effective preventative treatment for migraines. It offers relief from seasonal allergies, reduces inflammation and can lessen asthma symptoms. 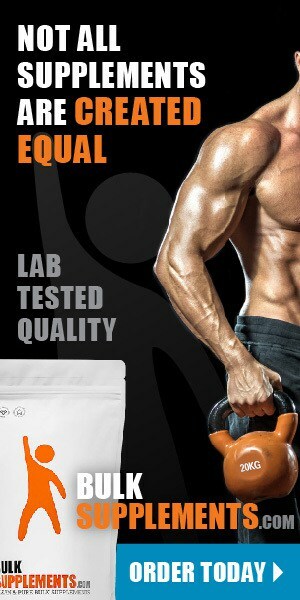 It also benefits heart and cognitive health. Because the herb comes in capsule form, it couldn’t be easier to add butterbur to your daily routine. You can take butterbur on its own or combine it with other herbs to see a marked improvement in many health conditions.